It is my desire to resume my Sketchbook Chats, so I’m picking up where I left off and offering you the fifth one! 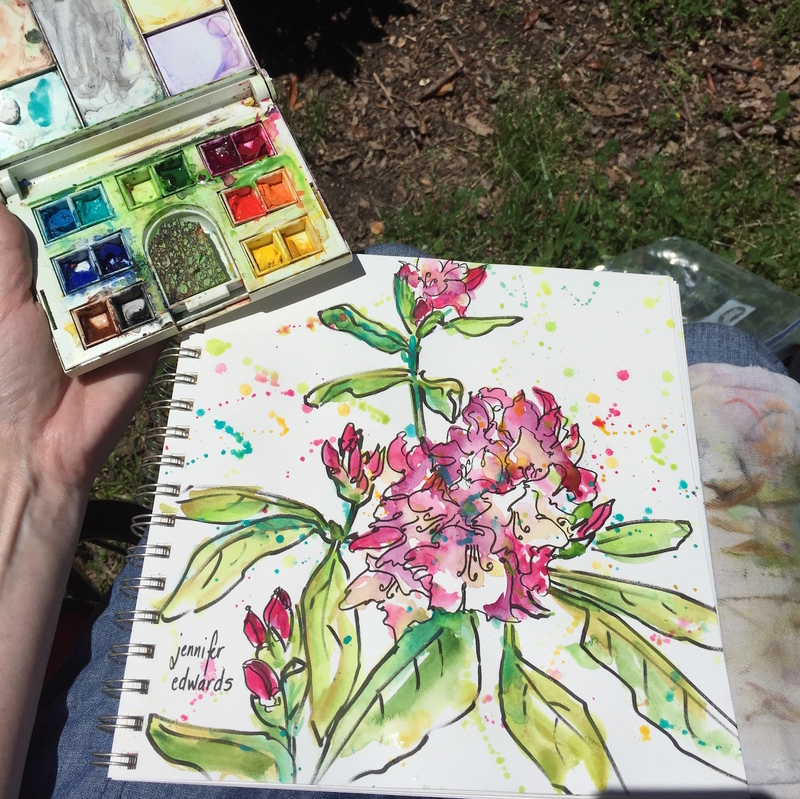 I was out in my backyard drawing the rhododendron bush that is showing off right by our deck. I had planned to video more outside there, but alas, a neighbor began to mow his lawn, so I came indoors to show more sketches, drawings, paintings, all from my sketchbooks over the last several weeks. I hope you are continuing to draw and sketch your life, finding beauty along the way! Drawings from a two-day sketch crawl in Boone, NC with my parents! Tips and techniques for you to try as well! I’m getting a bit better! This one is under 15 minutes! Woo! Hoo! 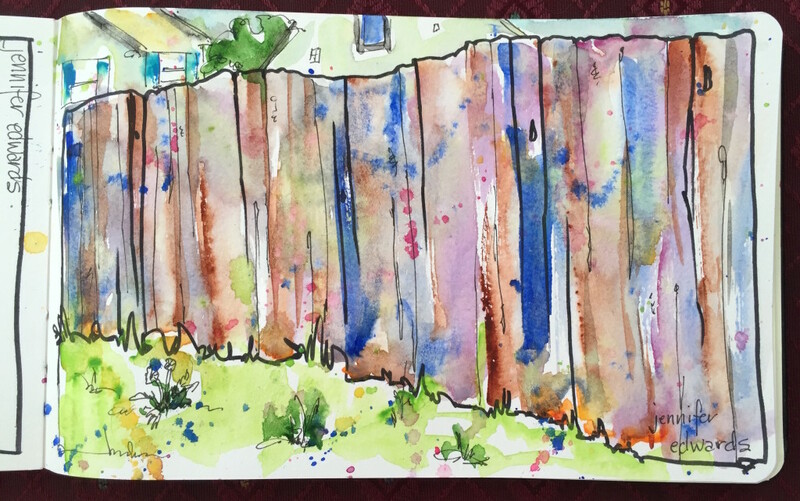 In this Sketchbook Chat I share a demonstration of adding watercolor to a drawing of a privacy fence. What I aim for in these videos is not to teach you exactly how to hold the brush or apply the paint, but ways to think about your subject, your medium, your intent in making the page in your sketchbook. To me, all of this is MUCH more important than merely how you hold your paint brush, or which colors to use where. I hope it inspires you to splash around with watercolor in the pages of your own sketchbook today. Thank you, as always, for spending your time with me in these videos! Subscribe to my You Tube channel so you don’t miss any of them! 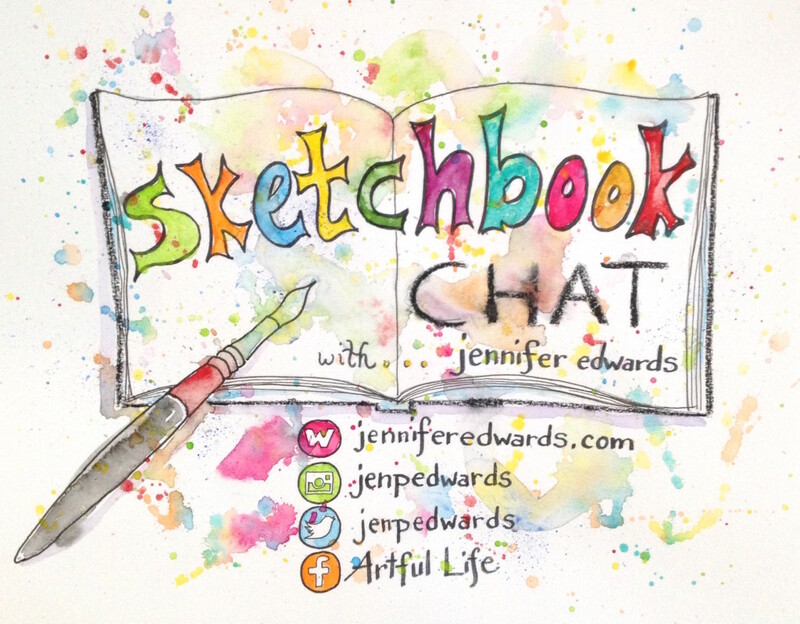 The second Sketchbook Chat is now up on You Tube for you to enjoy! Thank you again for spending your time with me in these little video-blogs! I truly am trying to make these shorter. But alas, after three tries on this one, it was still longer than the first!! Just make a cup of tea and pull up a chair to enjoy seeing another completed sketchbook of mine. And please do feel free to share this with others you know who might enjoy this!! I am excited to offer a new way to share my sketchbook with you! This is the first in a series of Sketchbook Chats where I will share with you anywhere from a few pages in my sketchbooks or a tour of a whole one (as you will see here). My aim is to inspire you to drawcument your life in a sketchbook as well! For now, I am not planning on this being a regular thing as life will surely interrupt whatever weekly or monthly schedule I choose. I am purposing to make these little videos UNDER 10 minutes. Well, I’ve already gone over on that with this first one! But rest assured, they will certainly be short and sweet from here on! This one is longer as I wanted to share a Grand Tour of the sketchbook that includes my recent Stay-At-Home Pilgrimage which I posted daily over on APilgrimsDraw.wordpress.com. Please share this video with others you think might enjoy it! And subscribe to my You Tube channel so you can receive each Chat as they are created. Feel free to leave here in the comment section any questions you might have for me to answer in future Sketchbook Chats. I do so hope this is inspiring and helpful to you!